Prominent & Leading Manufacturer from Ahmedabad, we offer polyurethane tyre and tpu on nylon wheel. Polyurethane materials having high breaking point offers excellent elasticity. 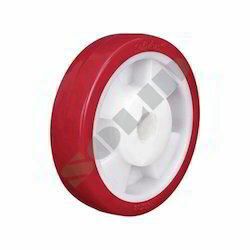 Wheels center made of PPCP / Nylon material and made of Thermo Plastic Urethane (TPU). Wheels are injection moulded under Controlled Temperature and Pressure. Non Marking, Smooth & Silent.